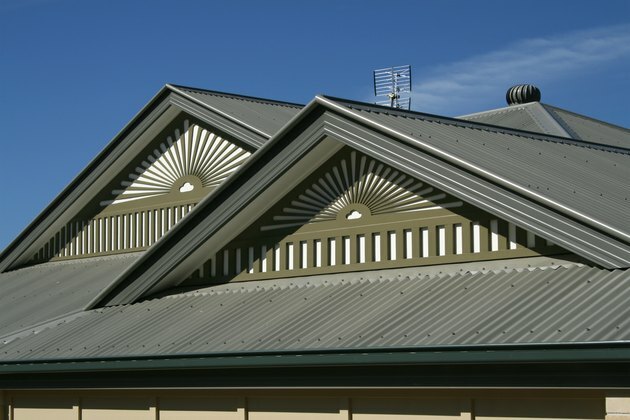 Metal roofing is galvanized steel or aluminum. Though metal roofing sizes can vary based on the material the panels are made from, both metals are formed into two basic types of roofing panels: corrugated or standing seam. Corrugated panels alternate ridges and valleys and are installed with ridges and valleys overlapped at seams. Standing seam or structural panels have broader flat areas with upright supporting elements which also serve as seams, with a flat side of one panel sliding into a groove in the adjacent panel. Installing a DIY metal roof isn't difficult work, but depending on the climate you live in and the way your panels are installed, the required amount of metal roof overhang will differ. Metal roofing can be used on any pitch or slope of roof. The National Roofing Contractors Association recommends structural panels for flat or low-slope roofs, but corrugated panels are used in some areas with no heavy snow. Corrugated panels are more prone to bend under heavy snow loads. Standing seam is popular in some mountain and heavy snow regions because snow slides easily off its smooth surface. Most metal roofing is installed with little or no overhang either on eaves or gable edges because it tends to bend under heavy weights. A typical metal roof overhang may be 2 to 4 inches, or even less. Some slight overhang is recommended, in conjunction with a drip edge flashing, to prevent water from getting under the roofing and onto underlying wood. Metal is usually installed on rafters or "strip sheathing" rather than the solid decking used under other materials. You can install metal roofing with a wider overhang if you support it. Some metal roofs have wood-framed eaves that extend several inches or a foot beyond the house or shed wall to support metal roofing. This gets snow and ice "drip line" farther away from the building walls, without the danger of the metal roofing bending under the weight. Low-slope roofs are more subject to snow load damage than steeper pitches and so typically have little or no unsupported overhang which can bend. Steeper pitched metal roofs typically do not require much overhang, because snow and ice slides off the smooth surface so easily. Most roofing contractors recommend some method to prevent ice dams on metal roofs. These form when show melts, but then re-freezes at the edges of the roof, which typically get less heat from inside the building.